Wangen boasts an extensive range of industrial, sanitary and hygienic progressing cavity pumps. The pumps are involved in a number of industries from waste transfer and bio-digesters to cosmetics and food (dairy and pet food). They can do flowrates up to 260m3/hr and pressures up to 48 bar. Hygienic Variants have EHEDG approval. Wangen can engineer a solution to most pump problems and have the experience and expertise to create unique products. One such pump was made for a customer who wanted to re-process blocks of fat, without have to melt & re-crystallise. Wangen made a block breaker, with a screw feeder that moved the plasticised fat into an Eccentric Screw pump which then pumped it to a moulding line. The system was built to the highest safety standards and featured in-built CIP so that it could be cleaned without operators having to strip the machine down. That customer reported a six month pay back on their investment. Managing Director of HpE Process Ltd Andy Allman said a unique characteristic of the Wangen eccentric screw pump was its class leading level of hygienic design. 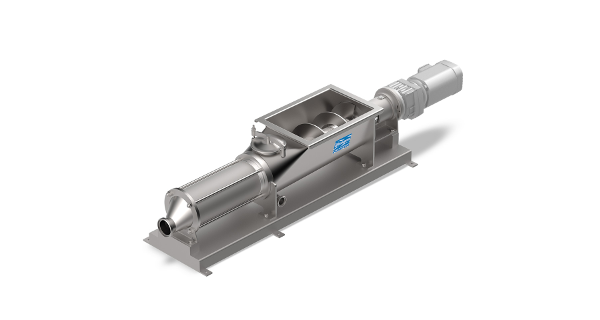 Wangen always consider the requirement to clean food machinery when they design something new.